Okay, so it's not a car, truck, or motorcycle. But it has wheels, tires, and an internal-combustion engine, and it does move under its own power. No matter how you look at it, this is an impressive model built by a MAMA member. At the November 2012 meeting this model quickly won over a very tough group of critics -- MAMA members. The buzz it generated wasn't focused on the fact that it was an airplane at a model car club meet -- it was solely focused on the workmanship of the build. 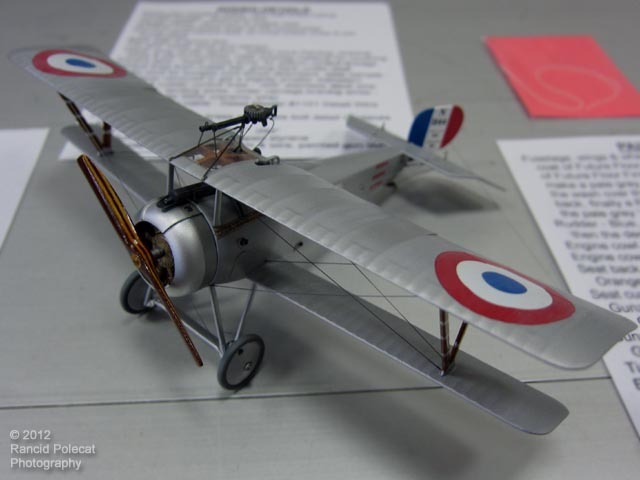 Norman's impressive build is based on an Eduard 1/48 kit of the WWI Fighter piloted in by Gervais Raoul Lufbery as a member of N-124 Escadrille Lafayette in 1916. Lufbery was born in France to an American father and French mother and served in both the French and US military forces during World War One. Norman added lots of extra plastic, photo-etch, and wire details including more framing, bracing wires, photo-etch turnbuckles, and clear poly material for the upper wing's center section.